By now you may have caught on to the fact that I have been anxiously awaiting Autumn’s arrival (sorry, I don’t mean to complain). And for just a brief moment, I allowed myself to believe that the glorious moment of seasonal transition was finally upon us…only to find myself, once again, sweating up a storm, shrugging the long sleeves and cranking the cooler. Oh well, what can you do? Sigh. Over the years in these desert parts, I have come to realize that summer does not easily give way to fall. 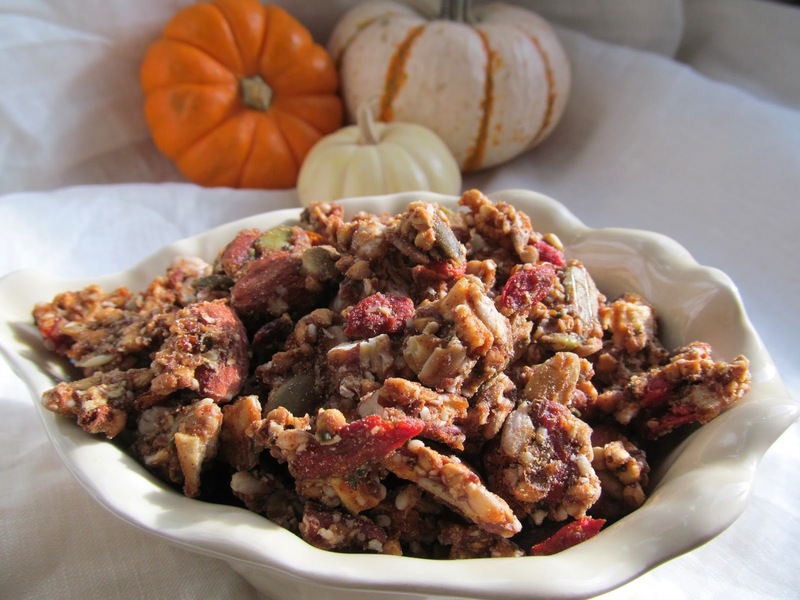 However, in a delightful moment of fall fervor, I totally and completely embraced the mood and indulged in creating some autumn spiced eats to commemorate that fleeting, teasing moment. 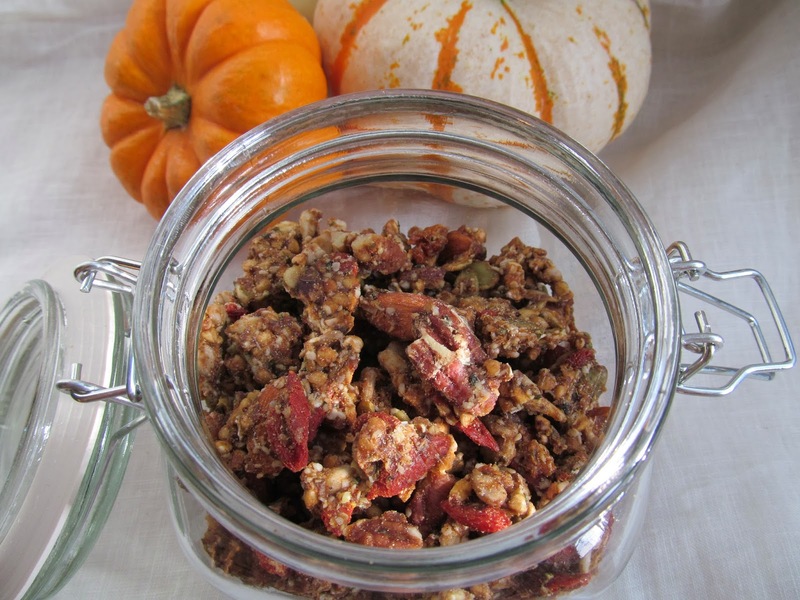 Among the goodies was this protein-packed raw pumpkin granola, too tasty not to share. 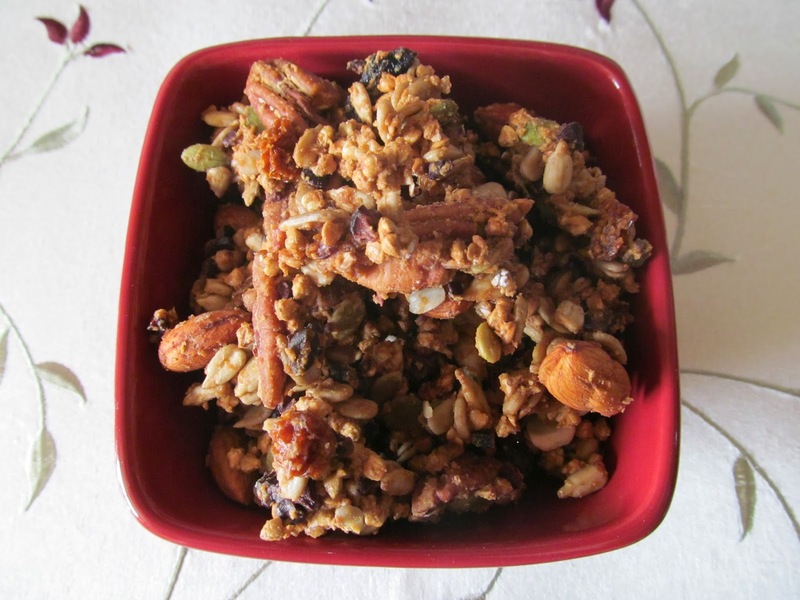 I do love granola! I have very fond childhood memories of this sugar-laden, calorie-packed, “healthy” cereal. Ours was an oatmeal household. A big pot, made from scratch, on the stove every morning…whether we wanted it or not. Raisins and a drizzle of honey were a sweet indulgence. My yummy memories of the boxed store-bought granola are always associated with our family camping trips or a week on the lake in the houseboat. A box of granola was a special treat reserved for our big family adventures in the great outdoors. Ah, good times. In these, my little less young years, I rarely buy granola in a box. When I weigh the sugar and calories against the benefits of more nutrient dense choices, my practical side wins every time. However, this protein-packed cereal satisfies that nostalgic inner granola girl and my superfood fiend, all at the same time. Besides which, it is a cinch to make and can be easily altered to fancy any flavor style. It all started earlier in the season with this cherry chocolate version. I was looking for something nutritious, high in protein and tasty enough to beat the trail food blues. I found a granola recipe in this book, made with a base of raw nuts and seeds rather that the traditional oats and grains. It sounded perfect! 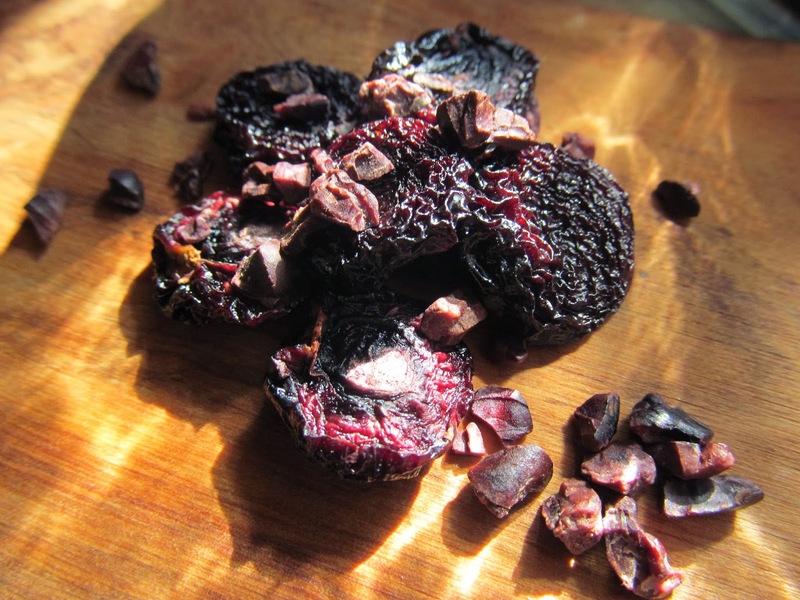 I altered the recipe a bit to reflect my personal fondness for a chocolate-cherry combination. Early in the summer, when the organic stone fruits where copious, I dehydrated some cherries and stashed them away, hoping one day they would fulfill some wonderfully creative purpose. 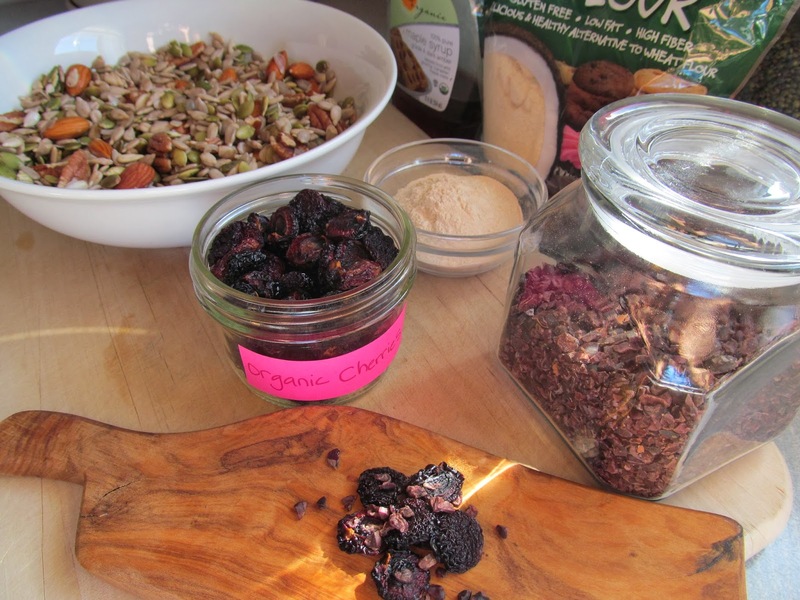 Armed with my cherries and some cacao nibs for an added chocolatey crunch, I set out to create the perfect trail treat that was both sweet and satisfying. 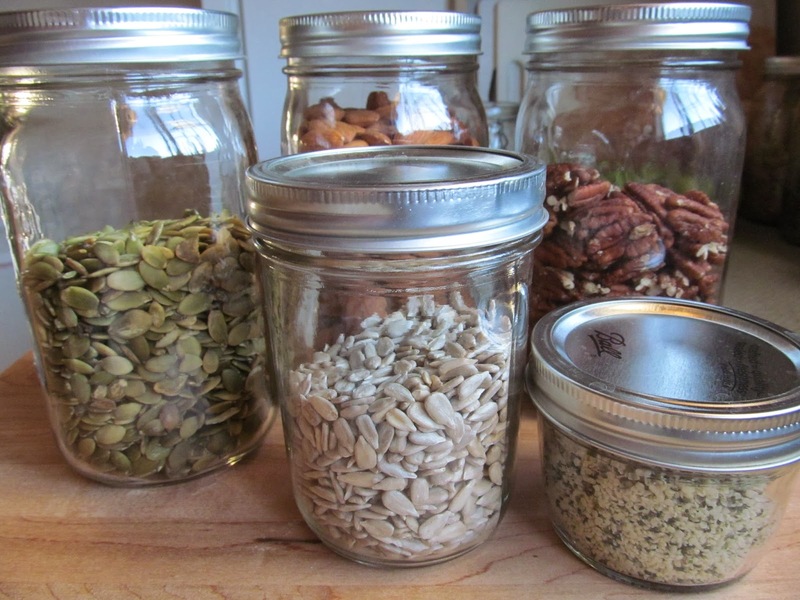 Whatever flavor notes inspire your personal granola creation, we begin the adventure by soaking the nuts and seeds. Actually, the recipe calls for buckwheat groats that have been soaked for 6 hours, then dehydrated for 12 hours. This may require a little planning ahead. Or you could just skip the crunchy buckwheat groats all together, but they really do add something special. I happened to have a jar on hand, all ready to go. So, I started with the nuts and seeds. 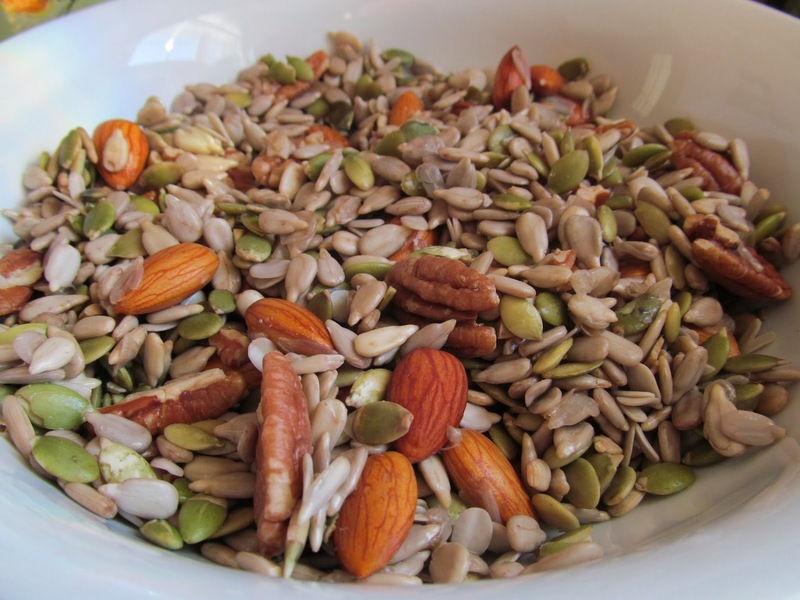 In a large bowl, cover the nuts and seeds with filtered water and soak for 6-8 hours. Drain and rinse well. 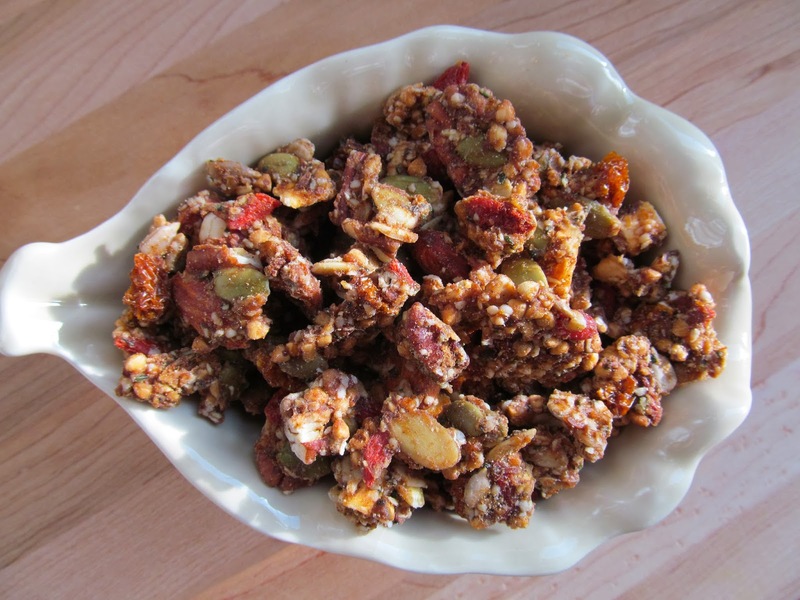 Mix soaked nuts and seeds, dehydrated buckwheat groats and all remaining ingredients. Mix until ingredients are well incorporated. About halfway through dehydrating, take out trays and break up large clumps to even out the dehydration process. This summer inspired version was perfect for the trail. 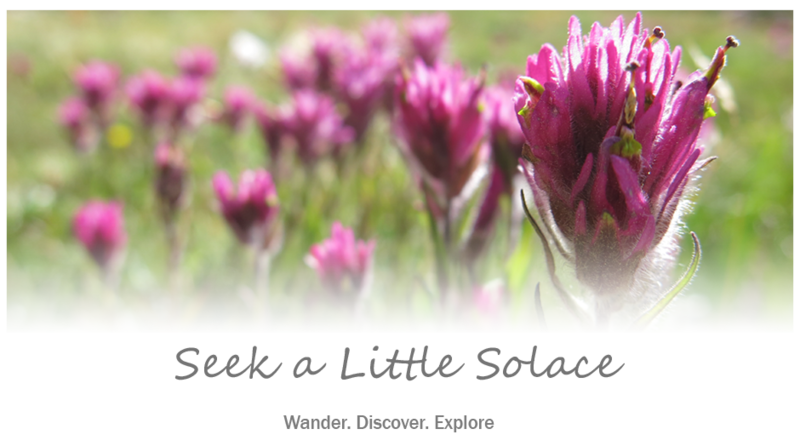 Slightly sweet, a tiny bit tart, high in protein and able to withstand a day in the pack. 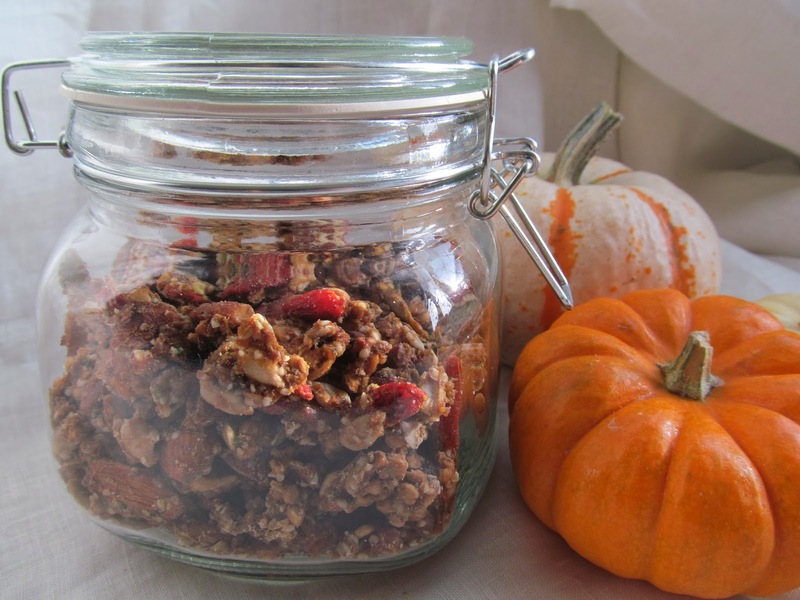 And when my little moment of autumn permeated my kitchen, I thought of this granola…with pumpkin…and warm spices…mmm. Let’s give it a try. For this warm and cozy version, I simply added some pumpkin puree, ground flax seeds and pumpkin pie spice. I replaced the summer cherries with autumn apples. I also snuck in a little extra superfood protein and antioxidants, with some hemp seeds and goji berries.